Walk The Walk – art. college. life. One of the most important ways to determine if a school is right for you is to visit. If you can help it, don’t make your choice without setting your feet on campus. Heading off to college is expensive for students and parents, in money and time. You can learn a lot about an institution online, from college advisers and from friends, but there is nothing that can replace the feeling you get walking the hallways, touring the studios and yes, even checking out the other students. Everyone has his or her own indescribable benchmarks, things that need to be felt first-hand to know it’s the right place. Following my oldest son’s junior year in high school, we took an east coast trip, visiting a number of colleges along the way. At the time he couldn’t understand why someone would name a school “Tufts University.” I guess he felt it was a silly name for a college. Well, you can guess what happened. We toured the campus, sat in on an information session, and he was sold. He knew he found his place. It met all his detailed criteria and had his “it” factor. There is an added benefit to visiting the colleges you’re considering attending: showing interest. In today’s highly competitive environment colleges and universities want to see each prospective student’s interest in their institution. Compare it to knowing ahead of time that someone likes you before you ask them out. Makes you more interested when you know you’ll get a positive response, right? In this case, when decision time rolls around, it can help push the school in your direction. What to do while you’re there? Taking a tour and sitting in on an information session should be the minimum. If you can afford the time to sit in on a class or stay overnight you’ll get a chance to talk with current students and get a real feel for campus life. And, as an art student, studios should be part of the tour. Make sure you see them; that’s where you’ll spend a large chunk of your time! 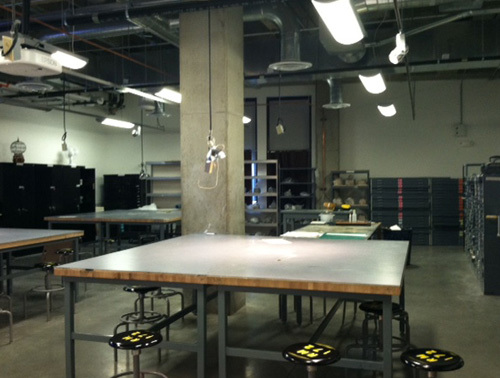 A Foundations studio waiting for students at UC Boulder.